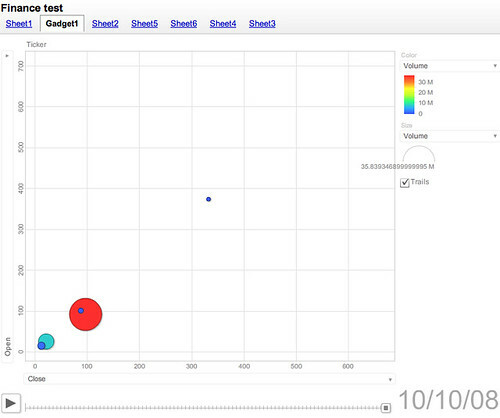 This function will pull in live – and historical – price data for a stock. # Stock quotes and other data may be delayed up to 20 minutes. Information is provided “as is” and solely for informational purposes, not for trading purposes or advice. For more information, please read our Stock Quotes Disclaimer. 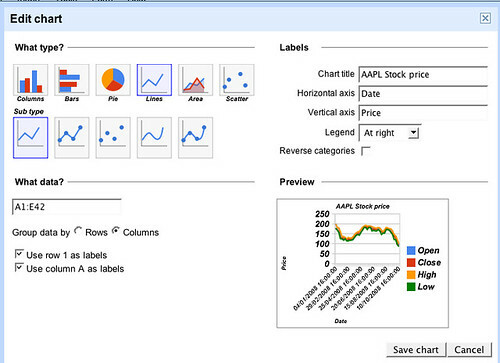 # You can enter 250 GoogleFinance functions in a single spreadsheet; two functions in the same cell count as two. If I was using live pricing data, I think the image would update with the data…? This will pull in the historical price data for IBM. 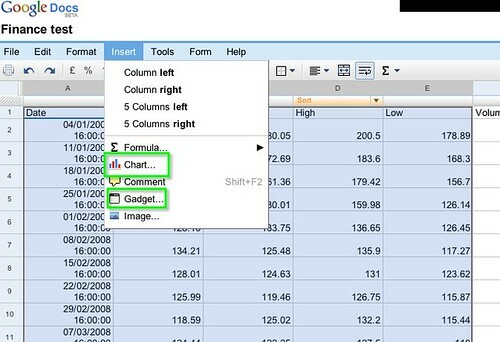 That key value – the value between “key=” and “&hl=en_GB#” is important – to all intents and purposes it’s the name of the spreadsheet. Generally, the key will be the characters between “key=” and an “&” or the end of the URL; the “&” means “and here’s another variable” – it’s not part of the key. 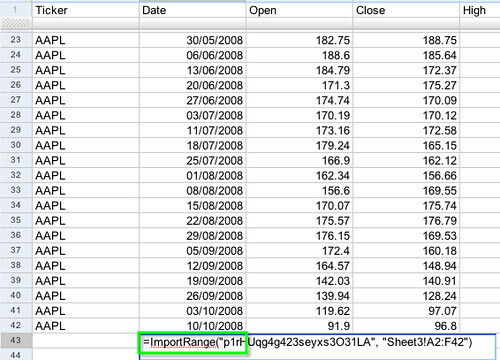 What ImportRange does is pull in a range of cell values from another spreadsheet. 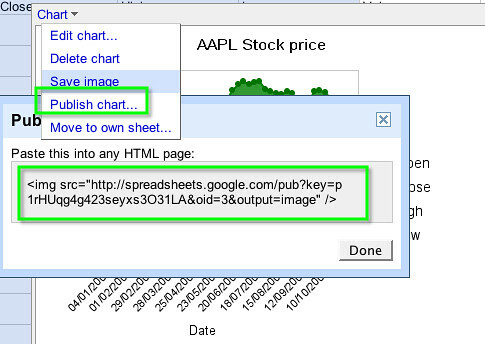 In this case, I’m pulling in the AAPL historical price data from Sheet2 (but using a different spreadsheet key, I could pull in data from a different spreadsheet altogether, if I’ve made that spreadsheet public). These rows will need labeling “IBM”. 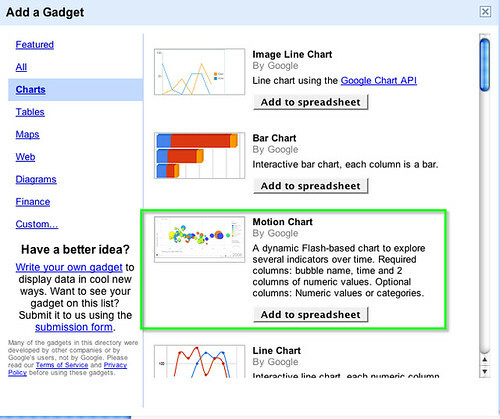 Import some more data if you like and then… let’s create a motion chart (info about motion charts. PS for a version of this post in French, see here: Créer un graphique de mouvement à partir de Google Docs. 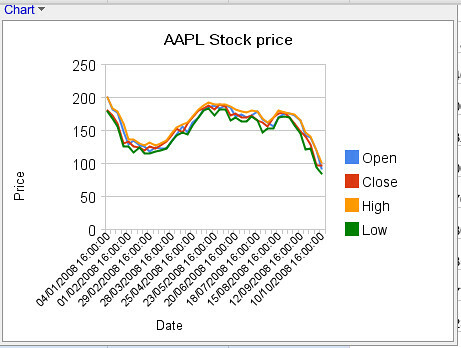 I get an error in spreadsheets when I paste the function you mention: GoogleFinance(”IBM”, “price”, “1/1/2008″, “10/10/2008″, “WEEKLY”); surfing through the api, “all” doesn’t seem to be a valid attribute. Notice the URL posted for the documents include &hl=en_GB which designates a certain key set. What was the reason for using importRange() and what advantage would there be over using a direct sheet or range reference? Yes it can, just make sure to enable “Automatically Republish” in Share -> Publish as a Web page. Re: using importRange() – I was just trying to give an example of how to use the formula; if it hadn’t been so late last night, I’d have set up different spreadsheets to show how data could be pulled in from them. The post isn’t so much a ‘best practice’ guide, as a ‘here are some reusable patterns/constructs for grabbing data and moving it around’. It seems as though a cell normally updates whenever google feels like it – at most every few hours or so. A response I received said that it is possible to trigger an update to the cell by composing any import request with a finance function that by itself will trigger an update every two or so minutes, and by modifying the original import url in such a way that it will always appear different to get around any caching of the page that google does (so you don’t keep getting old data). Very cool (again! ), thank for sharing (again!). @Greg Thanks for digging that stuff about cell updates up; I had half wondered about setting up a cell that generated a random number, and then constructing a URL with that random nuumber as a dummy variable, to try and generate a unique URL each time? Great how-to’s. FWIW, there’s a lot of campaigning potential in these tools; for example, the Sunlight Foundation has an awesome dynamic visualisation of political contributions by the finance, insurance and real estate industries, showing how they peaked as regulatory mechanisms were being dismantled. The “post-hegemonic backlash,” heh. Keeping you on your toes? Nah, don’t worry. so that we can get the data for the particular symbol if someone select a symbol like “GOOG”. Is this possible? It will be helpful if we need to show many symbols and I guess it would be tough to write the above line for many symbols. Please let me know. You can also email me!! Haven’t had a chance to look at visualizing it yet re the various Many Eyes options. I will know by mid-day tomorrow once Libor rates have been updated whether the live element will have worked or not.